The headquarters and downtown station of the Orleans-Kenner Electric Railway were located at 127 South Rampart Street between Canal Street and Tulane Avenue. 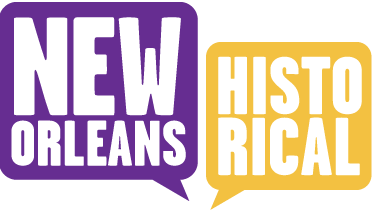 Better known as the "O-K Line," it was New Orleans' only interurban rail line. As an interurban, the O-K Line operated differently than New Orleans' standard streetcar lines. Tickets were purchased in advance from the downtown ticket office. The one-way fare on weekdays was a whopping 30 cents, but round-trip excursion rates on weekends allowed riders to enjoy a round-trip outing in the country for roughly the same price. The line traveled along South Rampart, Tulane Avenue, and South Carrollton Avenue to South Claiborne Avenue in the manner of an "express" line. Only a couple of designated stops were made before the line crossed from New Orleans into rural Jefferson Parish. Here the route followed what is now Jefferson Highway into the town of Kenner. Many patrons of the O-K Line were commuters who worked in downtown New Orleans and lived in Jefferson Parish - either in Kenner or Harahan, or in one of the burgeoning residential subdivisions nearby. Others operated farms or dairies and used the line to transport their goods to the city as it was cheaper and easier than the nearby railroad services. The O-K Line opened in 1915 and enjoyed its greatest success during the early to mid-1920s. 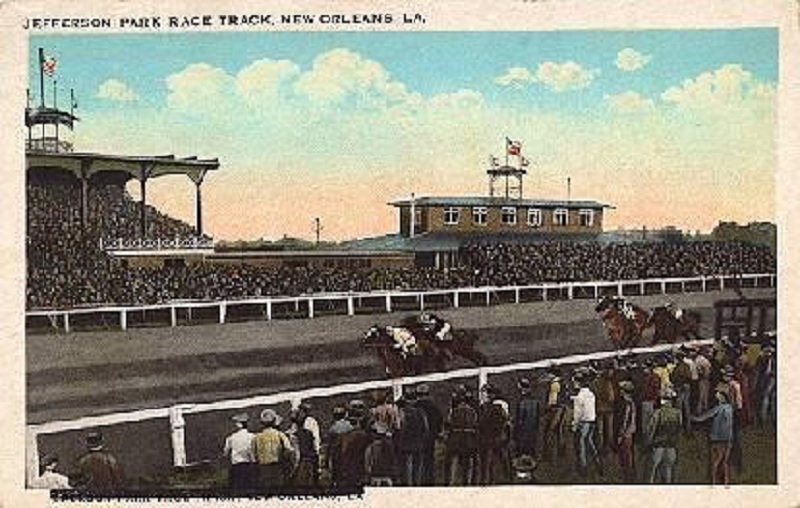 Two popular points along the line drew large seasonal crowds: the Jefferson Park Race Track in Shrewsbury (once located opposite present-day Riverdale High School) and Felix Park, an amusement park and picnic ground at the foot of Williams Boulevard in Kenner. The paving of Jefferson Highway in the late 1920s contributed largely to a decline in patronage as the identical trip could now be quickly made by automobile. The line ceased operations at the end of 1930 and rapidly faded into obscurity. 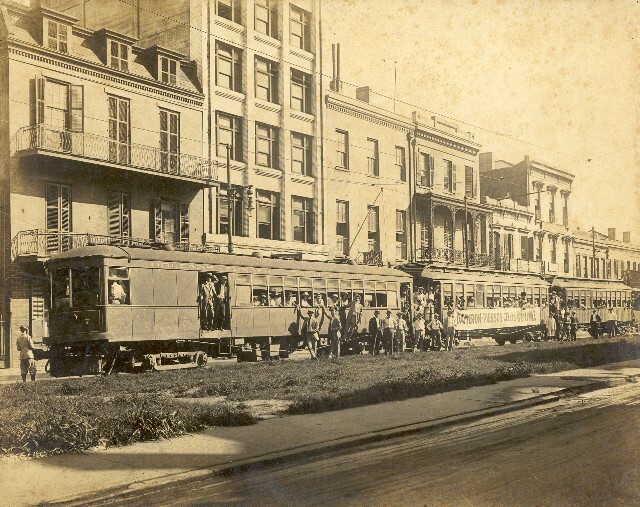 O-K Line, South Rampart station, 1910s: This photo shows a line of O-K trailers reserved for an excursion, sitting in front of the downtown terminus on South Rampart Street, sometime between 1915 and 1918. H. George Friedman's, "New Orleans Streetcar Album." 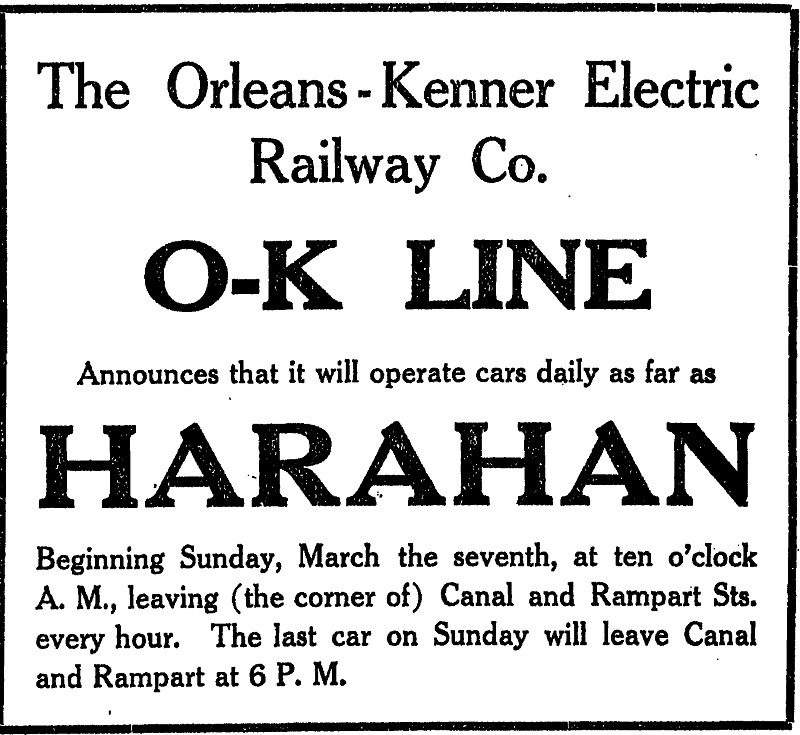 O-K Line service inauguration ad, 1915: This newspaper advertisement announced the extension of the O-K Line's service to the new community of Harahan in March 1915. By the following February, the line had reached its furthest extent, the Jefferson/St. Charles Parish Line in Kenner, 16 miles from Canal and South Rampart Streets. The Times-Picayune, March 5, 1915. O-K Car #7: This is a rendering of O-K Car #7, which was built by the American Car Company and delivered to New Orleans in February 1916. Prior to its arrival, the line was forced to use smaller streetcars borrowed from other lines. H. George Friedman's, "New Orleans Streetcar Album." 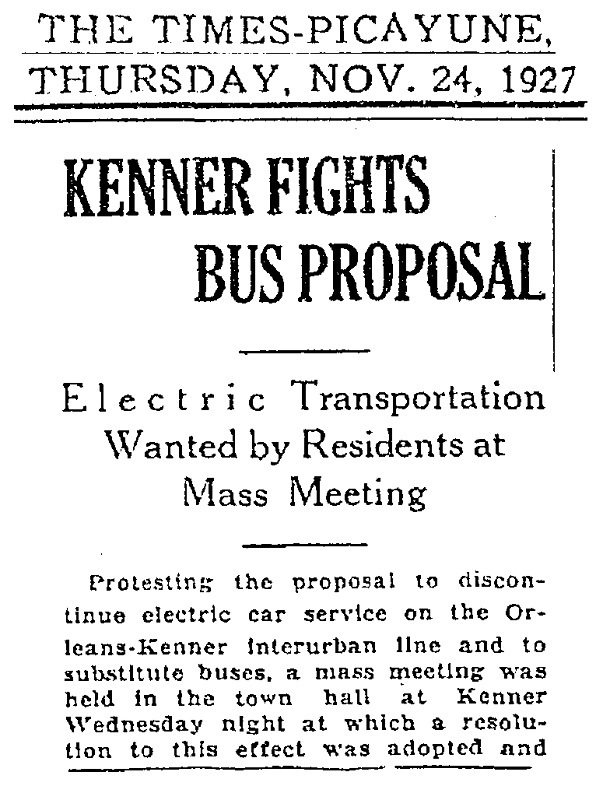 Community Protests proposed bus service, 1927: By 1927, the most successful years for the O-K Line had passed. Decreasing patronage led the Orleans-Kenner Traction Company to increase fares on the line. The company's power station in Harahan supplied the electricity to residents along the route, and rising utility rates proved to be highly unpopular. Nevertheless, support for the O-K Line staved off its abandonment and conversion into a bus line for another three years. The Times-Picayune, November 24, 1927. Jeremy Deubler, “O-K Line: S. Rampart Station & Overview,” New Orleans Historical, accessed April 24, 2019, https://neworleanshistorical.org/items/show/310.